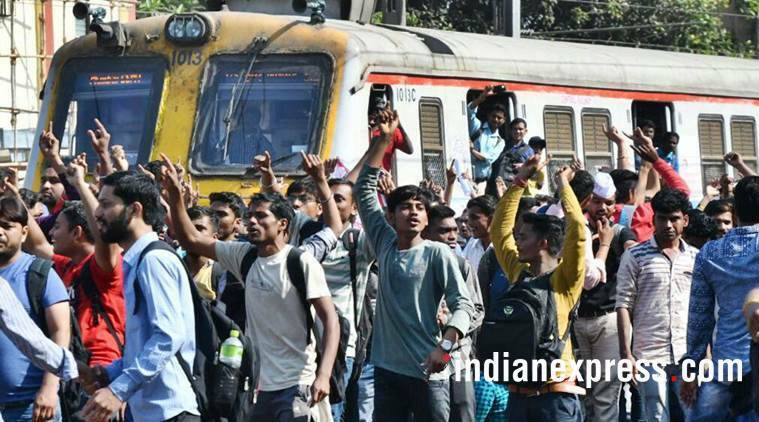 Peak hour traffic on Central Railway local lines was thrown off gear after agitating students stormed the tracks and blocked trains between Matunga and Dadar stations. The Government Railway Police (GRP) is probing who instigated the protesters, including the members from the union, to start a rail roko on Tuesday. Peak hour traffic on Central Railway local lines was thrown off gear after agitating students stormed the tracks and blocked trains between Matunga and Dadar stations. The protest that started around 7 am was called off around 10.30 am on Tuesday. “On Monday evening, our Dadar unit picked up leads that the Matunga workshop, which has nearly 50 per cent of the apprentice workers, was planning a major protest including a rail roko the next morning. The number (of protesters) suspected was around 300, and accordingly, we had prepared to take care of any law and order fallout. The senior inspectors of the GRP were already stationed near Dadar by 7 am on Tuesday. The city police and the Railway Police Force (RPF) were also intimated and they were present on the ground,” said a senior official, who did not wish to be named. “However, the maximum number of those who participated in the protest were not from Mumbai. To complicate matters, the protesters mixed with commuters making identification difficult,” added the official. “Our priority was to ensure that commuters weren’t hurt as that would have led to a major law and order situation. The trains that were halted were all locals moving towards CST. The ladies’ coaches follow the motorman’s cabin, and our priority was to get the women commuters moved out,” added the official. However by 8 am, the protest had turned violent with the agitators now pelting stones. The GRP decided to lathicharge to get the mob under control and avert any stampede-like situation. “Since the protesters were identified and the commuters were separated, a decision to lathicharge was taken,” added the official. “The biggest fear was there shouldn’t be any stampede and therefore the decision to lathicharge was taken once the commuters were moved out,” added the official. In the interim period, additional reinforcement was called in. However, with the negotiations on between the agitators and the Railways, the police decided to limit its action to the lathicharge. “Since the negotiations were on, we decided to limit our actions to lathi charge. However, the State Home Department was appraised about each and every development and also the possible action in case the protesters had turned more violent. The additional deployment had also reached by then,” added the official. By 10.30 am, the impasse was broken and the police took a backseat after the Railways assured the protesters that the Railway Board will discuss and resolve the issue.